Profit on Heifers in Declining Markets? Recently we wrote about Wally Olson’s ideas for a no-depreciation cow herd, which include sell-buy accounting and avoiding real depreciation on older cows, which typically begins about five years of age. It also centers on capturing real appreciation in young cows, which often happens prior to that five-year timeframe. Now, we’re going to show you an example how this type of marketing system could profitably work its way through the downturn of the cattle markets, beginning in 2014. The budgets for three years we see here demonstrate how selling “upgraded” or “appreciated” heifers can keep you in the business, plus put money in your bank account — or provide potential to grow your owned equity in the cattle you are buying and selling. These are hypotheticals, but based on a composite of real prices Olson and most others were paying over the three-year period. If that heifer was sold the next year, in 2015, as a bred animal she would have brought about $2,200. If she was once again replaced by a weaned heifer calf, which was would be kept for a year and bred, after cost of carry, that would leave a profit of $640, or a cumulative profit for the two years of about $1,975. 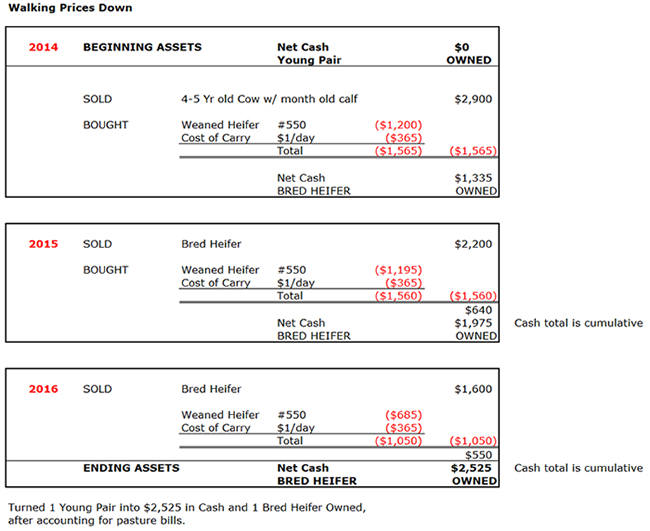 If in 2016, the process had been repeated, with the heifer sold and replaced by a weaned heifer calf, and cost to carry that calf was again figured into the heifer’s value, the profit on the trade would have been about $550, bring the total profit for the three years to about $2,525. Without the trades, that original cow would now be 6 to 7 years old and steadily depreciating, a cost which must be weighed against the value of each calf she produces. Of course, Olson stresses repeatedly you must keep track of your inventory of cattle and grass, and you must place a realistic value on those cattle each day, looking for opportunities. At times, sell-buy trades like this will work. At times they will not. Now that we’ve looked at the potential for this way of thinking, let’s also address some realities of managing such a method. As Olson mentioned in the first article, he uses low-cost breeding and figures about half of the heifers will get settled. Typically, he says, one would sell the open heifers as feeders. However, if you use your ingenuity, you might imagine other ways to peddle these critters. One idea might be to keep them longer, giving them another chance to breed. The potential profit over your costs must always be the deciding factor.